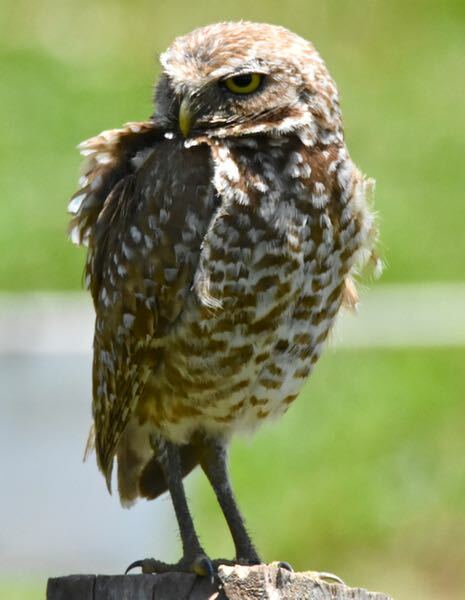 Burrowing owl, photographed at Vista View Park, Davie, Broward County, in May 2016. There aren't many birds that are identified as much by where they live as by their looks. 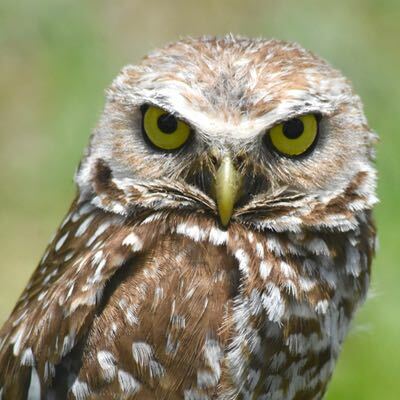 If you see a small brown owl with long legs sitting atop a hole in the ground or a fence post in an open field, chances are it's this guy, the burrowing owl, Athene cunicularia. 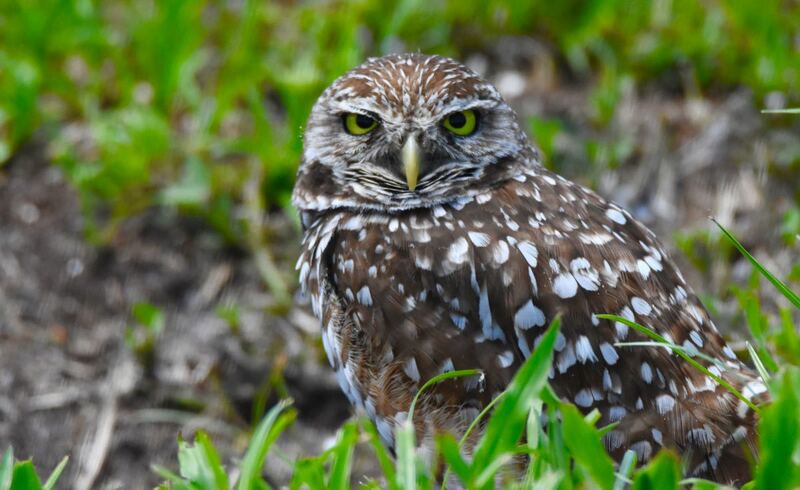 Burrowing owls are found throughout much of the United States but only in Florida east of the Mississippi. Their range extends from the Great Plains, through parts of the Rockies to the Pacific Coast states, particularly California. They're found as far north as Canada, to Mexico and Central America and occasionally as far south as Panama. Cuba and the Bahamas are also part of their range. The Florida birds are a subspecies, as you might expect given its geogrphic isolation from the majority of the owl population. They are known scientifically as Athene cunicularia Floridana. (The western owls, by the way, are known as A.c. Hyrugaea.) Regardless of where they're found, burrowing owls are something of a rare bird. The U.S. Fish and Wildlife Service considers burrowing owls to be a "species of conservation concern." Florida also considers them a species of concern. 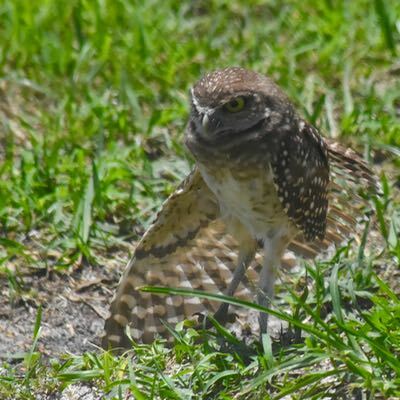 However, two of the best areas for observing burrowing owls happen to be the South Florida — Cape Coral on the Gulf Coast and the western Broward communities of Davie, Pembroke Pines and Cooper City. They're not difficult at all to spot in places like Vista View or Brian Piccalo Park as well as in some smaller parks, where their burrows in open fields are roped off for protection and to keep park patrons at some minimal distance. They are small as owls go, with a body that's about nine inches long but their wings are unusually long for the size, with a span of 21 inches. They have vivid yellow eyes and long legs, an important feature for a bird that essentially lives on or near the ground. They lack the feathery "ear" tufts prominent on other owls. Adults are brown and white with a white chin mark and sharp barring on the chest. Juveniles don't have the barring and are more buff on the chest (see the photo at the far bottom left). In flight, they have an undulating style and are capable of hovering, a helpful skill while foraging for bugs and other critters. According to the Fish and Wildlife Service, the burrowing owl is the only North American owl that doesn't exhibit reverse size dimorphism. In plain language, it's the only owl where males are the same size as females. In other species, the guys smaller. And they do live up to their name. 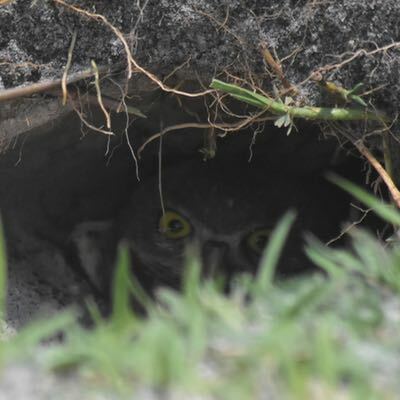 Burrowing owls dig holes typically four to eight feet long where they'll live year round but occasionally they'll borrow a used gopher tortoise or armadillo tunnel. They'll raise their young there during the spring breeding season and roost there during the remainder of the year. 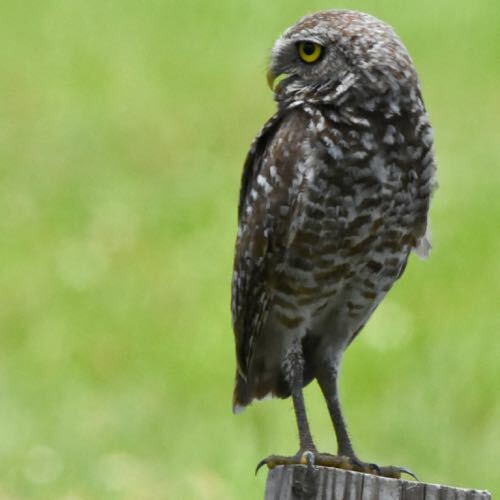 In some places, burrowing owls are migratory; Florida's birds are not, although the state's population might receive a bump during the cooler months. Their habitats include places that are high, with sandy soil and sparse vegetation, places like dry prairies and sandhills. Their interaction with humans has been a mixed bag. Development and intense agriculture has destroyed much of the owl's natural territory, but cleared woodlands and drained wetlands have created new habitat. Owls have established themselves in airports, school campuses, pastures, parks and other open spaces. Their dinner menu includes a lot of grasshoppers and beetles, but they'll also down a few bugs we humans find disagreeable, including mole crickets and roaches. They'll also eat lizards, frogs, small snakes, birds and rodents. In Florida, March is the beginning of the owl's primary nesting season, but it can occur as early as October and as late as May. Females lay clutches of six to eight eggs that require three to four weeks of incubation, with mom doing the sitting. The hatchlings are white at birth, with their eyes closed. They'll first emerge from the burrow at two weeks, first fly at four, proficiently fly at six and leave their parents at 12 weeks. Burrowing owls can be found in most of the Peninsula and a few places in the Panhandle, most prominently Eglin Air Force Base. A Fish and Wildlife Service report done in the early 2000s found owls in 26 counties, but most were small groups likely to die off. Still, there were a few owl strongholds, including Cape Coral and Broward County as mentioned earlier. Out west, the owls are listed as endangered in Minnesota, threatened in Colorado and a species of concern in California, Montana, Oklahoma, Oregon, Utah, Washington and Wyoming. Pesticides, cats and dogs, intense development, human harassment, collisions with cars and trucks, and fire ants are threats. Burrowing owls are members of Strigidae, the family of true owls.